I would love to tell you about my own impression from Ukraine and from the Ukrainian people. It seemed to me that they every day they carry with them a little bit of pain. I have returned to Spain almost 5 months ago but still every day I live and remember, just cannot forget the economic situation in Ukraine in which all these amazingly wonderful people live. I could write this story from my own experience and my own impressions. I learned a little of Cyrillic alphabet and some words of Latin root, and in some way we could talk to people, during our adoption in Ukraine. The Ukrainian people are wonderful. They are sweet, sensitive, very educated people, helpful, generous; they will help you with the kid’s trolley on the subway or will help you to carry heavy packages. It is amazing but nobody will stare on you or anybody at the streets as we usually do in Spain. But if you ask them something, they immediately will help you or try to solve the problem. They will help you to charge your phone, find places of interests and will try to help with everything with whatever you need with an astonishing simplicity. They have the same dignity to all people: notaries, doctors, supermarket guys…and will show the same warmth and kindness to anybody. They are calm and don’t make noise. Nobody shouts or gesticulates as here. On the buses people sit silently and when going out of the Opera House hundreds of people will be leaving the building but they will not be exceeding the 80 decibels. You will feel that they have high level of culture. They look more prepared than their Spanish contemporaries. They enjoy ballet, Opera, theatre, concerts... In their eyes you can read that they are educated, well prepared. They have been helpless economically but they like those who can show good standard of life and who has this good level of live showing their big cars and their fur coats without any hesitation. They like to learn, many of them know more than one language and if they have an opportunity, they practice with foreigners. They are very honorable. During all the period of time that we have spent in Ukraine the Ukrainian people never charge us wrong or ask more because we are foreigners. On buffet they never had lacked of food. It was full of different dishes. People differ from their government. People’s honesty is impressive in comparison with the situation of their Government. It is very different. The Government is very corrupt and barely covers anything. The State buildings, in general, are in bad condition and people must suffer. Because it doesn’t matter if you are a doctor or you have just retired, almost nothing is covered by the State. Officials in this environment think only about themselves, the paperwork and different proceedings are accelerated and solved with extra tips under the counter. We thus have a population where labor is scarce and the state doesn’t take responsibility and even doesn’t want to help. Neo-liberalism, a State that does not cover anything, has black money. There are many very religious Orthodox people; it’s very interesting to see them in the Church, so concentrated and full of prayers. A latent energy is palpable in the temples. The candles are lightening and people pray all the time, people of any age kneel before the icons asking and praying. And the priests, with long beards and long hair, are very involved and full of faith. The capital of Ukraine is Kiev. Modern Kiev is a mix of the old and the new, seen in everything from the architecture to the stores and music stars. Other little cities are not as rich as Kiev and have very poor areas. Our child was in the city where almost 70% of population was poor. The streets and the houses looked like from our childhood in Spain. Streets were without sidewalks, lamps but with the pipes which fall on the street. Buses were very old and in bad condition, like in Spain 40 years ago. Ah! One recommendation for you! During your adoption process in Ukraine you can try to find other adoptive parents. It is possible to find several couples of adoptive parents in Kiev or in the city/town/village where your adopted child resides. This is a great advantage while adopting in Ukraine because you all together can go sightseeing, share with the information, and wait together between appointments. But please be careful because while you spend time together, because all people like talk and you can hear a lot of gossips or corruption about the adoption in Ukraine. You must realize and understand that each case is different and situations are different, a LOT depends on the facilitator and your decision to be open and flexible. We got some new friends while being in Ukraine. Do not be stressed or nervous. Adoption must be interesting and great journey. It must be full of good moments and memories while you are adopting your child in Ukraine. I learned that for many people it is very easy to say: “Oh, poor black kids of African, they don’t have food”. But what did personally you do? What did you do to help? Have your ever tried? Because everybody can help, you just need to want to do that! It is such a great feeling to see orphans, when you visit orphanages and play with them, when you live with them their life, when you give them love. They need nothing but your love. In Ukraine these kids know how to love, they love to share and give you everything! I learned also, that we have very rich life in the very rich world and that our crisis is nothing in comparison with their hard life. I do hope that these hardworking and wonderful people will soon improve their economic situation because they so much deserve that. At the end of the story I just want to say that Ukraine gave me something that is the most expensive and even priceless, it is my son! That is the best in my life. Every new generation has created its own vision of everyday rules of life to follow, creating what we call today our national culture. Traditions and customs vary regionally within Ukraine. There are significant cultural differences between city and village, West and East of Ukraine. You will find that some Ukraine customs are similar with your own. Some of them you will consider incomprehensible. But they are neither "good" nor "bad"; they just belong to another culture and are therefore different. Ukrainians can look emotional and can talk laudly sometimes, they don’t usually smile when they walk on the street and don’t smile when tehy talk to you. They don’t show their big smiles. It is not because they are not friendly, it is just someting cultural. They just used to be like that. They are very friendly!!! Unlike people of most western countries Ukrainians tend to express their emotions freely. Whether they are positive or negative, Ukrainians are honest with their emotions, so don't be confused when you see it happening. In the South part of Ukraine people speak more Russian and on the West typically more Ukrainian. It is because of the history of Ukraine. The South part of Ukraine borders with Russia. But Ukrainian is the only one official language in Ukraine. Although majority of people can be bilingual. Ukrainians are traditionally family oriented people. It is common for parents or even grandparents to live together with their children and help them to raise their kids. This tradition was a necessity just a couple generations ago when the majority of Ukrainians lived in the little villages. Ukrainians are very hospitable; they love to invite people to their homes, to have long process with eating and drinking and of course conversations. The variety of food will surprise you! The Ukrainian cuisine is very tasty and has many great traditional dishes. (Borshch, vareniks with fruit, meat, cottage cheese, potatoes…, jelly meat, pelmeni (a kind of ravioli) and patties. Traditional Ukrainian cuisine is rich with natural ingredients. You will always remember the taste of fresh potatoes, tomatoes, cucumbers, pepper, lettuce, onions, cabbage, apples and grapes grown in the famous fertile Ukrainian soil. Ukrainians love to eat pickled fruit and vegetables. They do that at home and you definitely must try some pickled cucumbers. The taste is unique. krainians love herbs and mushrooms. You have probable heard that in Ukraine people love to eat pork fat, that is called “salo”, they love to eat it with black bread and garlic and salt. There is one interesting tradition with the bread and salt in Ukraine. Bread and salt are the symbols of prosperity. Some people in Ukraine can be superstitions about black cats, broken mirror, Friday the 13th, lucky horseshoe, empty bucket…Everybody knows them and some people can joke about them but they all will be careful “just in case”. Usually at the meetings people don’t kiss each other. 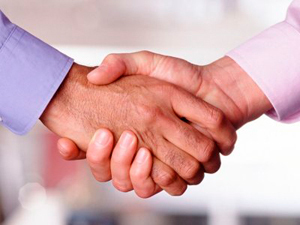 Men shake hands when they meet or introduce themselves and women only greet each other. When you enter house take off your shoes. Always try to sit between two people with the same name; it will bring you a big luck. Don’t be surprised when somebody spits three times over his left shoulder or sits on his luggage before going on a trip. The strangers don’t call each other informally. In addition, it is normal to use «sir/madam» speaking with elderly people. Ukrainians get married now being 20-33 years old. It is normal if they stay with their parents till they get married or finish university. The majority of people has higher education but works in areas that do not correspond to their achieved level. You can easily find the engineer who sells fruit. This occurs because of the country's frustrated economy.